For some reason, Samsung played a bit coy when it announced a pair of new Galaxy Tab 3 models yesterday, and left out the long-rumored Intel chip powering the 10-inch version. This morning Intel let loose with a little PR of its own, finally verifying what Reuters tentatively confirmed: there's Intel inside. The 1.6Ghz dual-core processor powering the Android 4.2 tablet is part of Intel's Clover Trail+ line. With Samsung's massive market presence, the Tab 3 10.1 could easily become the best-selling Intel Android device yet. Also inside the 3G HSPA+ and LTE versions of the 10-inch Tab 3 is an Intel radio, included in the Clover Trail+ system-on-a-chip. 3G models get the XMM 6262 radio, while the LTE models will pack an XMM 7160. The Z2560 is a dual-core chip clocked at 1.6Ghz, and includes the SGX 544MP2 GPU clocked at 400Mhz. Intel claims that the SoC provides double the performance and triple the graphical capabilities of earlier Atom-powered Android devices, with "competitive" battery life. The 10-inch Galaxy Tab 3 is Samsung's first Intel-powered Android tablet. 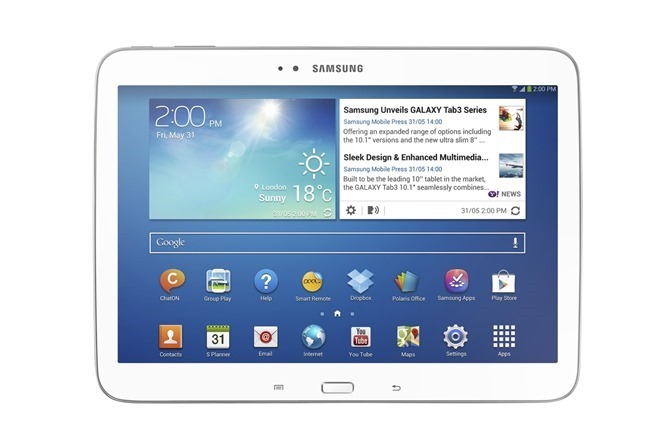 Both the 7-inch and 8-inch versions of the Galaxy Tab 3 will stick with Samsung-designed processors. The new Galaxy Tab 3 models are set to launch worldwide later this month. SANTA CLARA, Calif.--(BUSINESS WIRE)--Signaling the company’s continued momentum in the tablet market segment, Intel Corporation today announced that the new Samsung GALAXY Tab 3 10.1-inch is powered by the Intel® Atom™ Z2560 processor (“Clover Trail+”). Additionally, the new Samsung GALAXY Tab 3 10.1-inch tablet will come equipped with Intel’s XMM 6262 3G modem solution or Intel’s XMM 7160 4G LTE solution. People expect more from their tablets, and the dual-core Intel Atom SoC ("Clover Trail+") platform for Android* tablets provides double the compute performance and 3x graphics capabilities with competitive battery life compared to the previous-generation Intel Atom processors platform. Intel Atom processors are designed and optimized for a lightning-fast applications experience, responsive Web browsing, stunning 3-D graphics, advanced camera capabilities and vivid HD video with energy efficiency for outstanding battery life. The integrated Intel® Graphics Media Accelerator provides compelling and realistic 3-D gaming experiences, 1080p HD video and crystal-clear graphics. Advanced camera features including face recognition, mobile HDR and panorama help users create like never before. Additionally, Clover Trail+ offers dual-core performance along with Intel® Hyper-Threading Technology, supporting four simultaneous application threads for smoother, seamless multitasking.